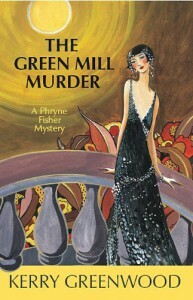 The Green Mill Murder: Phryne Fisher #5 (Phryne Fisher Mysteries) by Kerry Greenwood is an entertaining mystery. It kept my attention from start to finish. I gave it four stars. I will look for more Phyrne Fisher books to read since I enjoyed the character. "Pallid faces, over-rouged or under-coloured, blinked in the glare. Nothing looks worse, thought Phryne, than a brightly lit hall that should be dim." I received a complimentary Kindle copy from Poisoned Pen Press and NetGalley. That did not change my opinion for this review.